There is something incredibly satisfying about making your own bread. 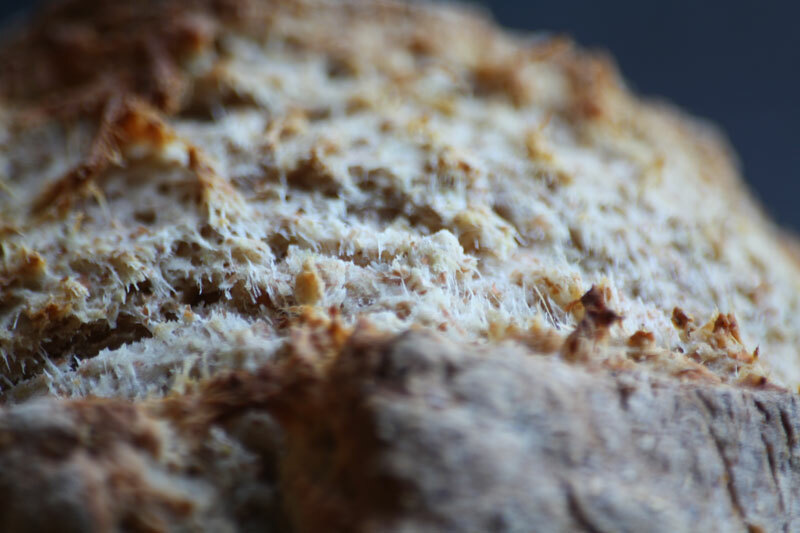 Bread is one of those things that we take for granted, because it's such an everyday item that holds a permanent place on our supermarket 'to get' lists. But it's not hard to make yourself, and if you have a couple of good basic recipes in your repertoire, you'll never have to go without the absolute freshest, most wholesome bread available. There are two recipes that I use all the time, so often that I don't even have to think about what goes into them anymore. The first is a basic white yeast loaf that I make every weekend, and sometimes during the week too if I'm in for the evening. I don't even remember where the recipe came from- I think I have just made so many different versions that I have finally settled on my own method that works for me. It doesn't take much effort, just 3 hours or so of your time- which if you're vegetating in front of the TV after a long day at work isn't too much to ask. The second recipe is for Irish Soda Bread, which doesn't use any yeast and therefore doesn't need any time to rise before baking. The result is a crusty, dense loaf that is great with soups and hearty stews. It is something you can decide to make at the last minute, and still have fresh-from-the-oven bread by the time you finish cooking the rest of your meal. 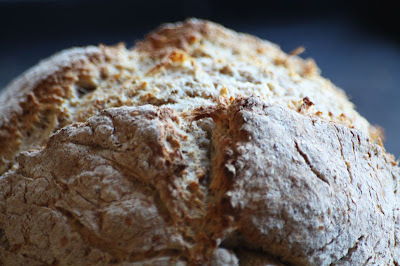 I use a recipe from James Martin, which I especially like because of the self-raising flour, which creates a lighter bread than some other recipes I've tried. However, it isn't traditional to use self-raising flour, but soft (or pastry) flour instead. 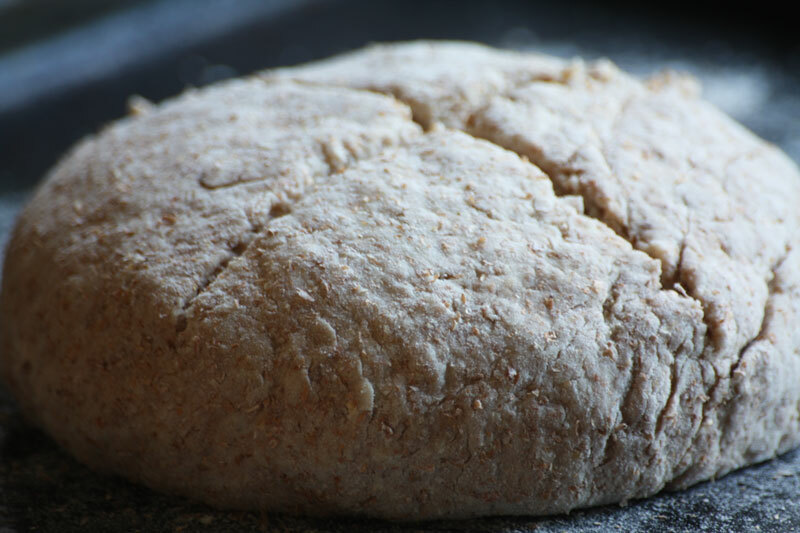 I use the bread hook on my mixer to do the kneading, but you could also do it by hand. Start by mixing the flour and salt in a big bowl (the mixer bowl if you're doing it that way). Separately, dissolve the sugar and yeast into the warm water, and add the oil. Pour the wet mixture into the flour, either into a well you've made in the flour if doing it by hand, or if you're using a mixer you can just dump the whole wet mix in with the speed on low. Mix until everything is well incorporated and a dough starts to form. At this stage you need to use your instincts a little to decide if the dough is looking too wet or too dry. You want it to be smooth and silky and elastic, not sticky. So if you touch it and dough gets stuck all over your hand, it's too wet. Add a little more flour if it's too wet or add water if it's so dry that it isn't holding together. Once you've got your consistency just right, you can either turn up the speed on the bread machine and let it run for about 10 minutes, or you can give yourself a workout by kneading by hand for 10 minutes. Put the dough in a lightly oiled bowl and cover with a tea towel, and stash it in a warmish place in your kitchen for two hours while it rises. After the two hours is up, punch it down and knead a few more times. Now put it in the vessel you plan to bake it in: I use an uncovered dutch oven, but you could also put it on a floured baking tray, or into a floured loaf tin. Let it rise for another 30 minutes while you heat your oven up. The oven should be hot- 220C/ 425F. Bake for about 30 minutes or untl the bread makes a nice hollow sound when you thump it. I try to let mine rest on the counter for about 10 minutes or so, but Steve has no self control and usually tears right into it. 250ml buttermilk, or plain milk with a tablespoon of vinegar mixed in. Combine your dry ingredients in a bowl, and then make a well in the flour and pour in the milk. I hold a little milk back, just to be sure that the dough needs it before I put the whole amount in. Mix together with your hands until it all comes together into a dough. As above, decide if it's too dry (won't hold together) or to wet (sticks to your hands), and add milk or flour accordingly. Knead the bread on a floured surface a few times, but it doesn't need much of this. Form it into a round, flat-ish shape on a floured baking tray, then cut a cross into the top of the dough to give it room to expand. Bake for 25 minutes at 200C/400F.